Staining brings out in contrasting colors otherwise colorless structural details of tissue sections. The coloring ability of many dyes resides in either their acid or basic radical. If in the anion, the dye is called acid, if in the cation, it is called basic. Acid components of a cell (like nuclear chromatin or chromosomes) stain with basic dyes (e.g., hematoxylin) and these components are referred to as basophilic or hematoxylinophilic (blue). Basic components (various kinds of cytoplasm and intercellular substance) take acid dyes (e.g., eosin), and are called acidophilic or eosinophilic (pink). Please note that there are numerous stains used to evaluate tissue for different purposes. Hematoxylin and eosin (or H&E) staining is the most common method of staining used for histologic sections. 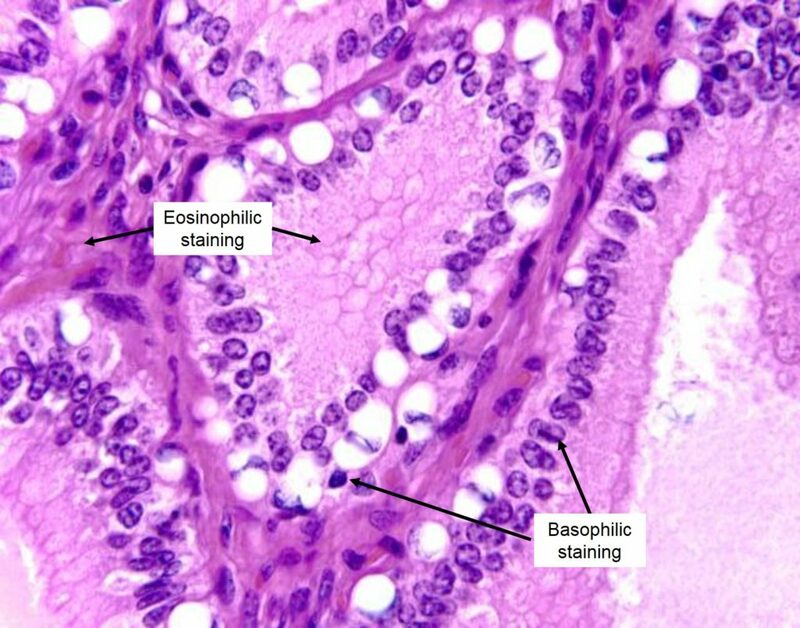 Basophilic and eosinophilic staining in a tissue section.